This entry was posted in Tossman Cryptic Crossword Solutions and tagged answer, crossword, cryptic, explanation, help, solution, tossman on December 14, 2018 by pavlov.a. 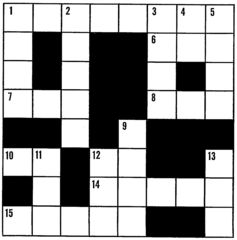 In 6 Across,’number’ is the definition – as in ‘something which makes you numb’. A play on words which crops up from time to time in cryptic crosswords!